Amid layoffs at the studios involved, the game will switch to a single-player RPG. First rumored in 2007, and shown off at E3 2010, Dark Millenium Online will drop the "Online" moniker from its title to offer an "immersive" RPG with single- and multi-player elements. THQ CEO Brian Farrell said the decision was made looking at current market trends - read ToR battling to steal WoW's numbers - and realizing it would take a lot more money to pull off any kind of success. Farrell called other companies to see if they were interested in ponying up the cash needed, but no one returned his calls. He decided to cut THQ's losses and make a spectacular single-player game, after writing a pink slip for 120 diligent game designers. "As previously announced, we have been actively looking for a business partner for the game as an MMO. 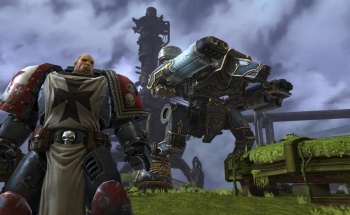 However, based on changing market dynamics and the additional investment required to complete the game as an MMO, we believe the right direction for us is to shift the title from an MMO to a premium experience with single and multiplayer gameplay, robust digital content and community features," said Brian Farrell, President and CEO of THQ Inc.
Farrell said the amount of work gone in justifies the shift rather than cancelling the game outright. "Because we believe strongly in the high-quality and vast creative work that is in production, this is the right decision for both our portfolio and for gamers devoted to this powerful property." Games Workshop, the company behind the Warhammer 40K miniatures game, is fine with the shift in focus. "We are genuinely excited about the new direction that THQ is taking with Warhammer 40,000: Dark Millennium," said Jon Gillard from Games Workshop. I'm not sure how Gillard can be "genuinely excited" about laying off almost 120 people. The collapse of the staff at THQ's development houses continues with a total of 118 full-time employees dismissed from Relic Entertainment and Vigil Games. Vigil will complete Dark Millenium and Darksiders II, while Relic will concentrate its efforts on the Dawn of War branch of RTS 40K games. As always, The Escapist sends its support to those affected by the layoffs at Relic and Vigil.